An extremely stable and compact touring kayak which is perfect for relaxed inland paddling. The Perception Sundance is an extremely stable and user friendly touring kayak designed for touring on placid inland waters. Thanks to its large open cockpit and wide hull, the Sundance offers confidence to even the most nervous kayakers and is an ideal boat for those who want to do easy touring on calmer days. Thanks to its compact size it has enough manouverability to turn quickly when required, yet its v shaped hull front and back will track in a straight line when you need it to. The Sundance features a high, supportive backrest and padded seat, adjustable foot pedals and a rear storage hatch with bulkhead to keep all of those essentials dry. We offer a delivery service for the Perception Sundance throughout the UK & Ireland to home and work addresses. If you are local to our shop in Hamworthy, Poole then we may be able to deliver a Perception Sundance with one of our own vehicles. For boats, this is free to most BH Postcodes - please call us on 01202 625256 to discuss your requirements. 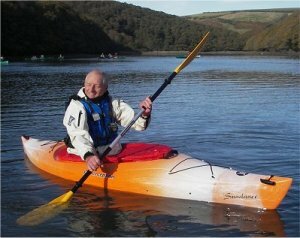 Buy a Perception Sundance online from our website and collect from our shop in Hamworthy, Poole or you can collect from any branch within the Canoe Shops Group. There is no cost associated with instore collection.